So, at my mom and dad’s house today, I walked around to the backyard and saw this. I got excited, dug my cellphone from my pocket as quickly as I could, before they noticed me and took off. 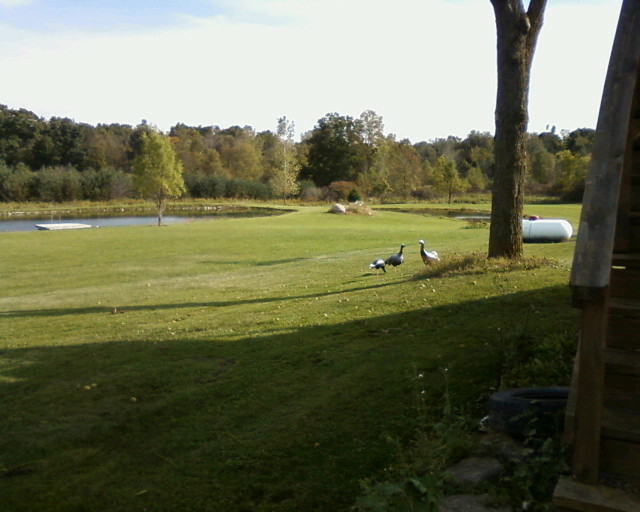 I took the picture, went back inside to tell my dad, and he tells me they are the turkey decoys he bought. I loved the HBO series Six Feet Under, but I had missed the last couple seasons. I didn’t see this video until a friend posted about it on Facebook a couple of months ago. Breathe Me quickly became one of my favorite songs, and the video, it’s one of the most powerful I’ve ever seen. I’ve watched it many times, taking in the music and the video each time. For me, it makes me think about what’s really important, what I need from life before it’s too late. There is someone I love very much, who I wish I could be with again, but I don’t expect we’ll ever get back together. The idea of living the rest of my life without her is kind of frightening. And Buddy turned six this month. That’s right. My cat, Buddy, he’s six years old. I don’t know if I’m one of those people who keeps track of the ages of their pets, but I got Buddy’s age pinned down. I’ve been living on my own since I was twenty-three and I’ve only had three pets in all that time. 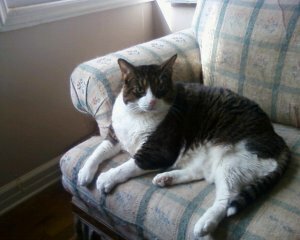 I got Buddy in September 2009 when he was still a kitten. I remember how small he was. But he quickly grew into the big purring monster that he is now. I mean he’s huge and quite heavy. He weighs more than my dog. Though he lies around the house a lot, he’s healthy and happy. He’s the best cat ever. He ended up getting the name Buddy because when I first got him, I didn’t know what name to give him. I was just calling him buddy because I didn’t know what else to call him. After a couple weeks of that nonsense, I realized Buddy should be his name. It fit. He likes it. Buddy”s my buddy. Though it looks like he was annoyed with me taking his picture this morning. 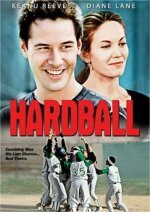 If you haven’t seen Hardball yet, I’m probably going to spoil it for you. There’s just a bit that I want to say about this movie. I watched it for the first time the other day and watched it again the next day. I was very touched by the movie. It’s another one of those kids’ sports movies, but then not exactly. It kind of makes you think of the original Bad News Bears, but with a harsher tone. Rated PG-13. Probably does have the go to be classified as a kids movie, but at the same time I’d say it’s a movie for adults. Keanu Reeves is the star. He plays Conor, a gambler who is deep in debt. In order to help payoff his debt, a friend offers Conor a job coaching a kids’ baseball team. What really caught my interest is the baseball team and the field they play in is at the old Chicago Public Housing Project known as the Henry Horner Homes, nicknamed the Hornet, because the buildings resembled hornet nests. The Henry Horner Homes were demolished in 2008, but the movie is from 2001, so the buildings were still there at the time. Though that was the year the demolishing began. I first heard about the Henry Horner Homes from the book There Are No Children Here: The Story of Two Boys Growing Up in the Other America, by Alex Kotlowitz, which I read in high school. It was a non-fiction book and the story really stuck with me. The Hornet was a terrible place to live and kids who grew up there saw so much hell that many did not expect to reach adulthood. So that was what really hit home for me in Hardball. The movie didn’t sugarcoat the life. It showed the fear the kids felt, how they were desperate to get home before it got dark and what living conditions were like inside the buildings. Toward the end, two brothers trying to get home were caught in the middle of a gang fight. The younger of the brothers was hit by a stray bullet and died in the older brother’s arms. That was life at the Henry Horner Homes. So, while the movie has much comedy, it has a harsh side to it too. It’ll leave you thinking about those living in ghettos across the United States. I’m glad the Hornet is gone and I hope the people who once lived there have found better lives. Okay. Yeah. 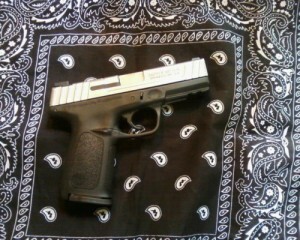 I’m the proud owner of a Smith & Wesson SD9 VE. I’ve heard that a lot of people consider this pistol to be junk, but I don’t see that it is. Faulty trigger, they’ve claimed. What’s wrong with the trigger? It seems fine to me. It functions just right, far as I can tell. Some have said they hated the gun for other reasons, but whatever those reasons are, I’ve come to love my SD9 VE and I know people who also love the SD9 VE as well its twin, the SD40 VE. Not everyone agrees that any particular pistol is good, so if you don’t like the SD9, that’s fine. But me, personally, I think it’s a great gun, very reliable. The SD9 VE holds 16+1 rounds. That’s a nice load to have if you ever find yourself in a situation where you have to defend yourself from more than one criminally intent person. I guess such a circumstance is rare, but it could happen, you never know. Okay, so, I love my SD9 and I find it to be a great pistol. But I’ll be honest, when I first got it, I wasn’t so sure. I took it out of the box and went out to shoot it. The first problem I had was loading the magazine. I had so much trouble putting the first bullet in and after I managed to get the bullets in, I couldn’t fill the magazine. It’s a 16-round magazine, but I could only fit fifteen rounds in it. After so many failed attempts to get that sixteenth round in, I decided that this was a flaw Smith & Wesson needed to address, that the magazines did not actually hold sixteen rounds as Smith & Wesson claimed. So, with fifteen rounds in the mag, I decided it was time to do some target shooting. I put a few rounds through the pipe and then got my first jam. It went on like that for a while, a jam for every few shots. I was really beginning to have doubts about the quality of the gun. But you know what? All that was just the break-in period. 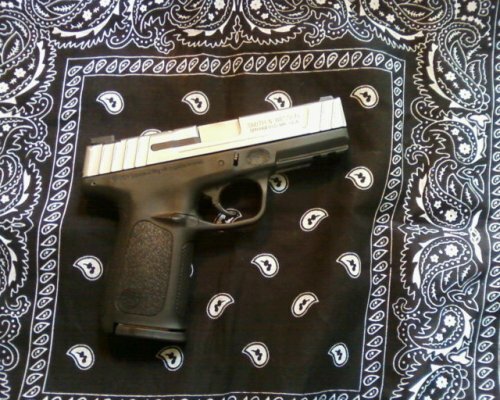 As I continued to use the gun, it began to function better. The issue with the magazines not holding the sixteen rounds that they were supposed to was just that the springs needed to get some usage. Eventually it was easier to load the magazines and fit sixteen rounds in them. I figured out later that when you buy a brand new gun, it’s best to oil it before taking it out to shoot for the first time. Oiling the gun before the first shooting will likely make the break-in period more pleasant. It’s a practice I stick to now. So, for me, the SD9 VE turned out to be a very good pistol and I’m glad I bought it. How long ago was it since I first discovered The Way on Netflix? Two years ago? I guess it wasn’t more than two years. Since the initial viewing, I had watched it several more times. It’s just one of those movies that entered my heart and will stay there. 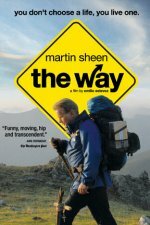 Anyone who hasn’t seen The Way, I recommend it highly. Martin Sheen is the lead actor. He plays Tom, an eye doctor. Emilio Estevez plays Tom’s son Daniel. Daniel quit medical school so he could travel the world. Tom is not a big supporter of this idea, but he accepts it A couple years go by and Tom gets a phone call from a French police officer who informs him that Daniel was killed in a storm while hiking. Great acting, wonderful sound tracks, and a beautiful story. W.P. Kinsella is the author of Shoeless Joe, the novel that the 1989 movie Field of Dreams is based on. He has written several other novels and short stories, many of them having to do with baseball, First Nations people and magic. “The Essential W.P. Kinsella” was released from Tachyon Publications in March and contains some of Kinsella’s best stories, including the short story Shoeless Joe Jackson Comes to Iowa, which was the seed for the novel Shoeless Joe. Kinsella celebrated his 80th birthday on the 25th of May. Interview conducted February 22, 2015. Rob Darnell: Much of your work has to do with baseball. Do you closely follow the sport? What teams do you root for? W.P. Kinsella: Not anymore. Loosely follow the Blue Jays. After the strike, I lost interest. In reality, neither players nor owners care in the least about the fans. The greed of both factions has destroyed baseball’s credibility, at least for the present. RD: Are there any MLB players at all that you feel are not caught up in the greed? WPK: As long as they are forced to belong to the Players Union, no. My hero will be the guy who tells the Union to get lost. RD: MLB politics aside, do you still agree that the game is beautiful? RD: Are there college, minor league or independent teams that you pay any attention to? WPK: No. Have never been a minor league fan. RD: Did you play baseball when you were a kid? If you did, what positions did you prefer to play? And how well did you hit? WPK: No. Played a little softball, but there was nowhere on the field it was safe for me to be. RD: When did your interest in baseball start and what sparked the interest? What inspired you to mix baseball and magic together? WPK: My dad talked a good game. A child got only the World Series on the radio. RD: What is the best World Series you can think of and what made it great? WPK: 1946, if my memory is correct. Harry “The Cat” Brecheen went against the Red Sox in Game 7. I stayed home to listen, practically had my head inside the radio. RD: What is your fondest baseball memory? WPK: Seeing Bob Forsch pitch a no hitter against Montreal. RD: Both, Harry Brecheen and Bob Forsch, played for the St. Louis Cardinals. You have fond memories of both of them. Does that mean you were once a Cardinal fan? If yes, why are the Cardinals not your team anymore and when did your love for them die? WPK: I became exclusively an American League fan when they instituted the DH rule, and will remain so until the National League moves out of the dark ages. RD: Over the years you’ve seen many players come and go. Who are the players that you admired the most? And what was it about them that made them admirable? WPK: Yogi Berra, Bill Lee, they were irreverent, poked fun at the stodgy owners and managers. Curt Flood, of course, was in a class by himself, a true hero. RD: In the early years, you had to listen to the games on the radio. Do you remember the first game you saw on TV? Was there any difficulty in making the transition from radio to TV? Was it more enjoyable to watch than listen to the games? WPK: Guess about 1954. Until Color TV came along, BW TV was too muddy to be enjoyable. RD: What was the first professional baseball game you had been to? And how old were you? Can you describe the experience? WPK: Edmonton Vs Calgary, 1946, age 10. First Major League game was San Francisco Vs L.A. Don Drysdale Vs Juan Marichal. Drysdale won. Didn’t realize how lucky I was. RD: Have you been to many MLB games? What professional baseball parks have you been to? WPK: At one time I’d been to every park except Baltimore and Houston, but can’t even keep track of who plays where these days. RD: In your opinion, who is the greatest baseball player of all time? WPK: It is hard to compare the eras, but Joe Jackson and Ty Cobb from the past, Sandy Koufax and Roger Clements from the present. RD: Do you like any other sports, such as football, basketball or hockey? If so, what are your teams? WPK: I’m a big fan of curling, follow all the major world events. Watch all four Tennis majors. Basketball is the worst sport. They need to raise the basket at least two feet. RD: You and Ray have the same last name. Is there more that the two of you have in common? Does Ray Kinsella mirror much of yourself? WPK: Ray is named for a Salinger short story character, but he mirrors some of my thoughts and experiences era 1980. RD: I’m a Detroit Tiger fan, so I want to know, what does the voice in Ray Kinsella’s cornfield have to say about the chances of the Tigers winning the World Series this year? RD: What do you say about Kevin Costner’s portrayal of Ray Kinsella? RD: You were happy with Field of Dreams. What about the other film and TV adaptations of your work? WPK: Pretty pitiful. I was lucky to get one good adaptation. Field of Dreams the Musical is lurking in the wings. Hope it will provide my daughters with a ton of money someday. RD: You’re also known for writing about First Nations people. What sparked your interest in that area? WPK: Found a good voice and took advantage of it. Each of my specialties was like a prospector discovering a vein of gold. I worked each until the vein was exhausted. RD: In 2010, you said that the state of the book industry was such that you would not be able to break in if you were just starting out. It’s 2015 now. In your opinion, is the situation better or worse than it was five years ago? WPK: I think it is worse for a mid-list author such as myself. You either have to sell like Stephen King or go with the small presses where there is no money. I was lucky to have been in the right place and time for many years. RD: What would improve the situation for mid-list writers? WPK: Less greed on the part of both publishers and chain booksellers. It is easier for them to publish and sell only blockbusters and leave the real work to small presses. RD: Though you are a mid-list writer, has your writing made you a comfortable living? Would you say the larger portion of your income came from your novel sales or your short story sales? WPK: In the 70s and 80s, I made a good living. Have managed my funds carefully, will never have to go out and cadge quarters from the tourists. My main income came from failed movie and TV options. RD: I read somewhere that you were reading books when you were five years old. What are some of your childhood favorites? WPK: Discovered W. Somerset Maugham in about 5th grade. Didn’t understand the plots, but loved the descriptions. RD: And for that matter, what are some of the best books you’ve read over the years? WPK: The Great Gatsby, the finest novel ever written. Dinner at the Homesick Restaurant, Anne Tyler, In Watermelon Sugar, Richard Brautigan, What The Crow Said, Robert Kroetsch. RD: Outside of baseball and reading, what are some of your fondest childhood memories? WPK: Uneventful, though isolated childhood. Good, kind, stable parents. RD: You’re a tournament Scrabble player. What is your highest achievement in the game? And how long have you been playing? WPK: I’ve played tournaments for about 20 years. My daughter, Erin, who lives with me, also travels to tournaments. While I’m not a top division player, I’ve won a number of tournaments. Won Portland one year at about 19/3. RD: You’re going to be 80 on May 25th. Do you have anything special planned for your birthday? WPK: Going to a Scrabble tournament in Edmonton in May, so will celebrate with family there. My agent, Carolyn Swayze, is planning a “surprise” party on the actual day. RD: This last question is from your novel Shoeless Joe. If you could do anything you wanted to do–if you could take time and turn it in your hands like rubbing up a new baseball; if you could stop somewhere in time, and in the silence and mystery and calm of that situation you could have a wish…? WPK: I lost my wife Barbara to cancer two years ago. I would give whatever time I have left to spend one more day with her. What’s so special about MSD? I often mention MSD, either in person or online. It’s MSD this, MSD that. When the old school building was torn down because a new school building had opened, I expressed sadness about the loss of the old school building. When a friend from MSD lost her son in early June, I fell to pieces over it. Jimmy Glover died at the end of July, and though I hadn’t talked to him in twenty years, I felt moved to post something about him on Facebook. Most recently, I stated that I want to see my friends from MSD before the year is over. 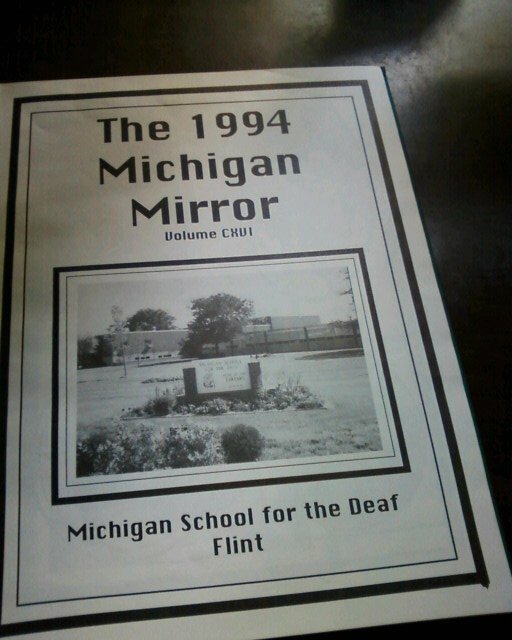 MSD–or Michigan School for the Deaf, if you got enough wind in your lungs to say the whole thing every time–is the primary school for the deaf in Michigan. There are other schools where the deaf are taught, but from what I gather, they are regular public schools where the majority of students are hearing. I’m trying to write something meaningful here, something that will properly convey why MSD is special, but I fear I’m not a good enough writer to do MSD the justice it deserves. But I’ll give it my best shot. Every former MSDer I know still looks on MSD with fondness. The place was more than just a school for most of us. It was a home. We lived five days a week there and went home for the weekends. Some of the students had attended the school, living in the dorm, since they started kindergarten. Others joined the school in later elementary grades, or junior high and high school. Many were transferred from Dearborn and Detroit schools where there were programs for deaf and hard of hearing students. But wherever they came from and whenever they enrolled at MSD, most of them already knew each other. They had attended camps for the deaf and other deaf events since early childhood. American Sign Language was their first language. Most of them could talk using their voices if they had to, but many preferred not to. Some were completely deaf. Some were deaf, but did have a little bit of hearing. And some were hard of hearing, like me. But whatever category you put them in, MSD was like a comfort zone for them, a place for them to be with others who were like them. At MSD, no one had to explain that they couldn’t hear you. Everyone got it. So, that was one frustration we didn’t have to deal with. Several teachers and staff were also deaf, and those who weren’t deaf were understanding of the students’ needs. I don’t want to turn this into a rant about my experiences at the Lapeer public schools I’d attended, so I’m going to try to be brief about it. I mean, it wasn’t always bad. There were some good times. There were students who I got along with and there were teachers who were patient and understanding. But on the flip side, there were many very stressful and humiliating situations. It wasn’t so bad in elementary school, but it really took a nosedive in junior high and it only got worse when I started high school. I wouldn’t say it was all because I couldn’t hear very well. My twin brother is also hard of hearing and he did all right in the public schools. But me, I was depressed all the time. I was terrified in school. When I got home after school, I’d go straight up to my room and spend the whole day watching TV or reading. I did not have a social life. My freshman year ended. I had my summer vacation and shortly before school started back up, the depression and fear returned. I did not want to go back. I think it was my mom who suggested I enroll in MSD instead. But wherever the idea came from, once it was in my head, I was all for it. I had been to MSD several times before, to see Betty Brown, have my hearing tested and get new hearing aids set up, but I had never thought I’d actually be a student there before my sophomore year. But once the idea was in my head, I was hellbent on making it happen. I felt that MSD was the change I needed. It took some time, though. We had to go through a few different meetings with the Lapeer Board of Education. School had already started, but I wasn’t attending yet. Some of the people at the meetings did not think MSD was the right place for me. But finally, about a month after school had already started, I was cleared to go. I didn’t know sign language when I first started at MSD, but there was Tina Takacs, Margaret Barker and sometimes Marilyn Belsky who put in the effort to teach me, and there were students who showed me signs. I learned sign language and improved, but I was always pretty much in the beginner’s stage. I’d be lying if I said MSD was a hundred-percent positive experience for me. Sure, there were plenty of negative experiences. I was still a shy, awkward guy who didn’t talk much. I still had nervous issues and I’d get depressed at times, and I didn’t quite know how to fit in. I still had many of the same issues I’d had at the Lapeer public schools. However, at MSD, there were far more positive experiences than negative experiences. I was actually happy there and living in the dorm allowed me to have a social life. As I learned more about deaf culture, I began to see myself in a more positive light. I learned that being deaf or hard of hearing does not mean one is impaired. I learned that deaf people do not see themselves that way and I wanted to think the way they do. Going to MSD is one of the best things I’ve ever done. It really turned my life around. I’m still in touch with friends from there. I wish I could see them in person on a regular basis, but they all live in different parts of the state and it’s hard for me to get around and see them. But we keep in touch on Facebook. One of my best friends had the funeral for her son today. I’ve had it on my mind all day. I love you, Brooke. I know it’s going to be hard for you and your family, but I hope everything works out somehow. My heart broke and tears flowed. I couldn’t understand how this happened. Something isn’t right in the world. But I guess He has His reasons. He’s always got some plan. We’ll all figure it out some day. I know it feels unfair. And we were all suggesting names. Then came the day your son was born. Everyone could see that he had spirit. We knew he was happy and loved. I know you have a hard road ahead. But light can be found at the end. My dad talked me into mowing his lawn today, with his zero-turn lawnmower, which I have never operated before. Zero-turn lawnmowers do not have steering wheels. Instead there are two bars in front of you. You push the left bar to turn right and you push the right bar to turn left. Heh! How does anyone keep an arrangement like that straight? On top of that, they are freaking fast lawnmowers. I almost ran into a tree and the natural gas tank, and I quickly decided I wasn’t going to mow within fifteen feet of the pond. Afterward, we went to Apollo Family Restaurant (Davison, MI) where we both had ribeye steak.